This is a vertically scrolling Danmaku shooter that features two playable characters to choose from for the main and two for the extra scenario, making a total of four playable characters. The game features four difficulties: Easy, Normal, Hard and Blizzard. The main part of the games system are two gauges at the bottom of the screen that rise when you graze bullets and collect items. Sesshouseki - Malice Eater (literally translated as Snow Crystal Gem - Malice Eater), is set in the fantasy world known as Saihate no Daichi (Farthest Earth), people lived in the guardian barrier that alleviates the cold that was stretched over this extremely cold land. But it has already been about 100 years since the activation of the barrier has started, and its efficacy has started to fade away gradually. And at a certain time, Yuki and Shigure, the rainy-season sisters go from different circumstances to a survey of unusual circumstances that took place in the barrier. It's not related to Touhou Project, However, it pays homage with elements such as the in-game history, gameplay, the Extra Stage and its music. 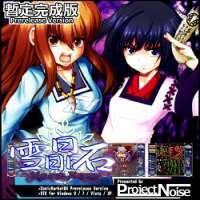 It was originally released as a paid doujin game at Comiket 84, but recently, can be downloaded for free via the developer's website.